One Source Equipment Rentals has pneumatic powered rock drills and accessories for rent or sale from Ingersoll Rand and Sullair. 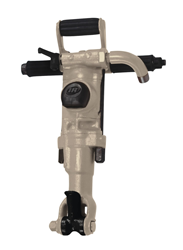 Rock drills are designed for production drilling of holes through concrete, rock and other hard materials. Compressed air is blown through the drill steel to clean cutting debris from the hole. These air drills are faster and lighter weight than electric rotary hammer drills and thus reduce operator fatigue. They are also safer to used in areas where electricity a problem, such as in and around water. Models range in size from 9 pounds up to 61 pounds. These small rocks drills are great for light duty drilling of smaller diameter holes. With more weight and power, our medium sized rock drill are used primarily for vertical drilling, but are still light enough to use horizontally in some applications. 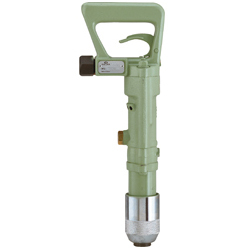 Our large rock drills are designed for vertical drilling deep large diameter holes. 1" 8", 12", 18", 24"
* Bit sizes vary by location. ** Lengths vary by location.